In Martin County, Ky., the water intake pulls from a river heavily contaminated by sewage and years of coal and gas extraction. Josie Delong, a resident of the county, says she used to drink tap water until a doctor told her it could be the cause of her health issues. "I had really, really bad bleeding ulcers to the point where I was actually blacking out," she says. "So I go to my doctor. The first thing he tells me is, 'Contaminated water. How's your drinking water?' "
Now, she says she does all she can to avoid drinking from the tap. She even puts bottled water in her children's bathroom when they brush their teeth. The county water treatment plant needs serious upgrades, and the distribution pipes are so leaky that they lose more water than they deliver. On cold winter nights, when customers leave their taps running to keep their pipes from freezing, the water district would cut the water off. If not, the tanks wouldn't refill, and there wouldn't be enough water to flush toilets. But when cut off, there's no pressure in the pipes, and filth can seep through the cracks. When the system is once again turned on, the water can be brown or black and very smelly. At a public meeting last year, Joe Hammond of the county water district faced a crowd that was angry about the lack of warning before the cut-offs. The Martin County water district is under state investigation for the third time since 2002. When they find a leaky pipe, Hammond says all they can do is patch it up. "You've got a little hole there already — it's going to get bigger," he says. "We just don't have the money to replace it with right now." Though the county has produced millions of dollars in coal and gas, little of the wealth has been invested in the water system. As the local coal industry has continued to decline, it's only become more difficult to find money for infrastructure investments. Scott Pruitt, the new head of the Environmental Protection Agency, says water infrastructure is a priority. But Gail Brion of the University of Kentucky, who has worked on water treatment issues for decades, is skeptical. She says she worries water pipes can't compete with more visible projects like roads and bridges. "What you're seeing is a long history of non-investment that's now starting to cause long-term problems, but it's not flashy," she says. "That's one of the problems with drinking water is that it's underground — it's hidden." Benny Becker reports for the public radio collaborative Ohio Valley ReSource. Copyright 2017 WMMT-FM. To see more, visit WMMT-FM. And let's talk about another issue that has been on President Trump's agenda. He's been promising to invest in infrastructure. And many hope that includes pipes for drinking water. A group of civil engineers last week gave the country's water system a near-failing grade. 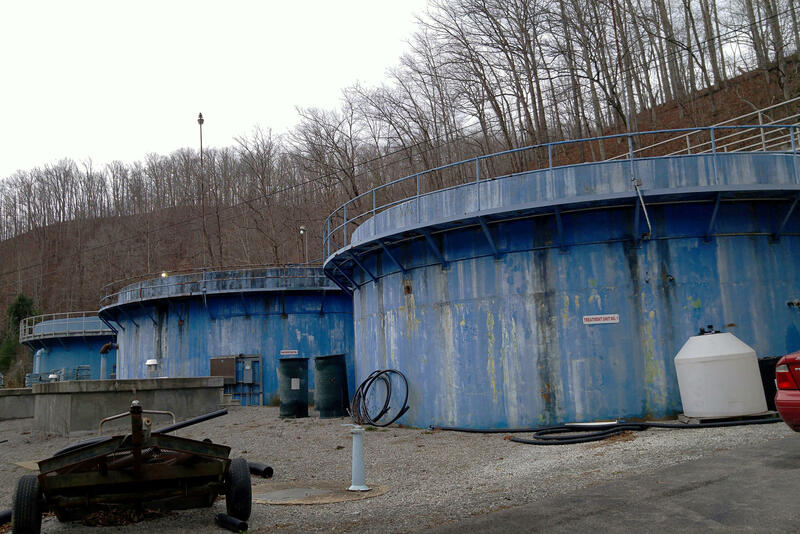 In eastern Kentucky, Benny Becker from station WMMT looks at one community that no longer trusts what comes out of its taps. BENNY BECKER, BYLINE: I went to a supermarket in Martin County and asked the checkout clerk how many customers buy bottled water. UNIDENTIFIED GROCERY CLERK: I'd say 75 percent, if not more. BECKER: Martin County resident Josie Delong says she does all she can to avoid drinking from the tap. JOSIE DELONG: I even put a bottle of water in my kids' bathroom when they brush their teeth. BECKER: Delong says she used to drink tap water until a doctor told her it could be the cause for her health issues. DELONG: I had really, really bad bleeding ulcers, to the point where I was actually blacking out. So I go to my doctor. The first thing he tells me is contaminated water. How's your drinking water? BECKER: There are a lot of problems with Martin County's drinking water. The water intake pulls from a river that's heavily contaminated by sewage and by years of coal and gas extraction. The treatment plant needs serious upgrades, and the distribution pipes are so leaky that they lose more water than they deliver. On cold winter nights, when customers leave their taps running to keep their pipes from freezing, the water system just can't keep up. Here's Joe Hammond of the water district. JOE HAMMOND: At night, they would shut it down so they could keep the tanks full for schools. BECKER: ...The water can be brown or black and very smelly. At a public meeting last year, Joe Hammond had to face a crowd that was really angry that the cutoffs had happened and that the public wasn't warned. UNIDENTIFIED MAN: I'll cut you off right here. Not nobody around town got the first call about a boiled water advisory. I'm done with it. It was a lie. BECKER: The Martin County Water District is under state investigation for the third time since 2002. When they find a leaky pipe, Hammond says all they can do is patch it up. HAMMOND: You got a little hole there already, it's going to get bigger. We just don't have the money to replace it with right now. BECKER: Martin County has produced millions of dollars in coal and gas, but little of that wealth got invested into the water system. As the local coal industry has continued to decline, it's only gotten harder to find money to invest in infrastructure. Gail Brion of the University of Kentucky has worked on water treatment for decades, including a stint at the Environmental Protection Agency. GAIL BRION: These water systems were established with federal money. That money has now become a revolving fund that has to be paid back. And when you can't pay for your services to begin with, how are you going to pay back a loan to make those services better? BECKER: Scott Pruitt, the new head of the Environmental Protection Agency, says water infrastructure is a priority. But Brion is skeptical. She worries water pipes can't compete with more visible projects like roads and bridges. BRION: What you're seeing is a long history of non-investment that's now starting to cause long-term problems. But it's not flashy. That's one of the problems with drinking water is that it's underground. It's hidden. BECKER: State and local water officials say they'll be looking out for any federal spending that could help them rebuild trust in the county's tap water. For NPR News, I'm Benny Becker in Whitesburg, Ky.
GREENE: And Benny's story came to us from the public radio reporting collaborative Ohio Valley Resource. (SOUNDBITE OF DIIV AND ZACHARY COLE SMITH'S "BENT - ROI'S SONG") Transcript provided by NPR, Copyright NPR.